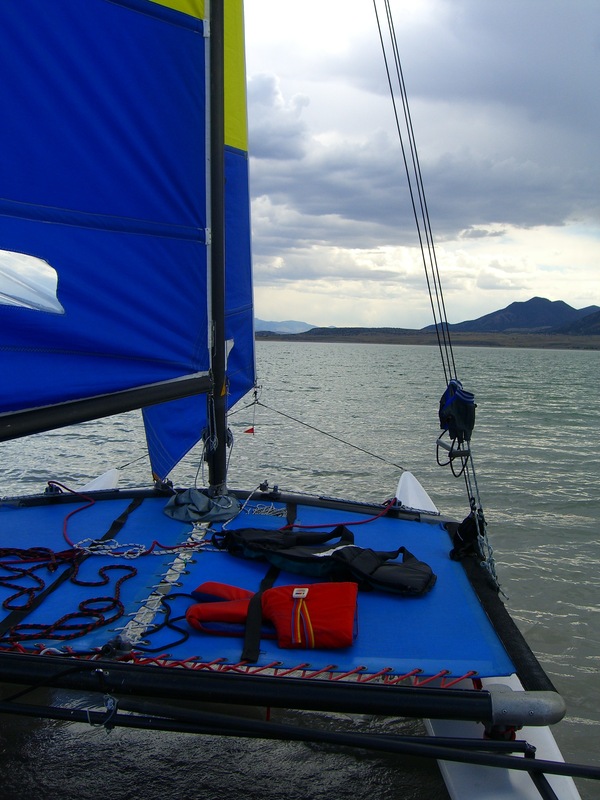 A Hobie Cat Trampoline can be one of the trickiest parts of tuning your boat. Because of the nature of the trampoline, you can dial your boat in. Let me explain. First of all the tramp comes in 3 pieces. 2 Sides, and 1 back piece to tie it all together. When you lace your trampoline, depending on how tight you do it, it will stiffen your boat, and make it so the hulls won’t flex. The more you tighten it up, the stiffer your boat becomes. Here is the other thing about tightening your tramp. The tighter you make it, it will also bow in your side rails. If you make your tramp tight, and then look down the side of it, you will see that your rails will bow in. If you really are tuning your boat, and want to hike out, or trap out farther to gain that little bit of extra speed, then the bowing will not allow you to move out as far as you regularly can. Although I don’t notice to much of a difference when I go out sailing, I like to have my tramp fairly tight. Just a little bow in the rails. This allows the hulls to stay together reducing flex between them, and still allows me to have fun on the trap! As far as lacing it together, you have a few different options. #1 – Stick with the single line. – Staying with one line is easy, and less time consuming when lacing your tramp. It also allows you to lace it without to much frustration. How to tighten your tramp. The best way to tighten your tramp is to use a good set of pliers. This way you can really use the pliers to pull, tug, and roll your lines into knots. Don’t overlook your tramp. It’s not just where you sit, but a vital part of your boat.